While There is Light will be exhibiting a collection of photographic prints in an upcoming exhibition around the theme of urban life and death. 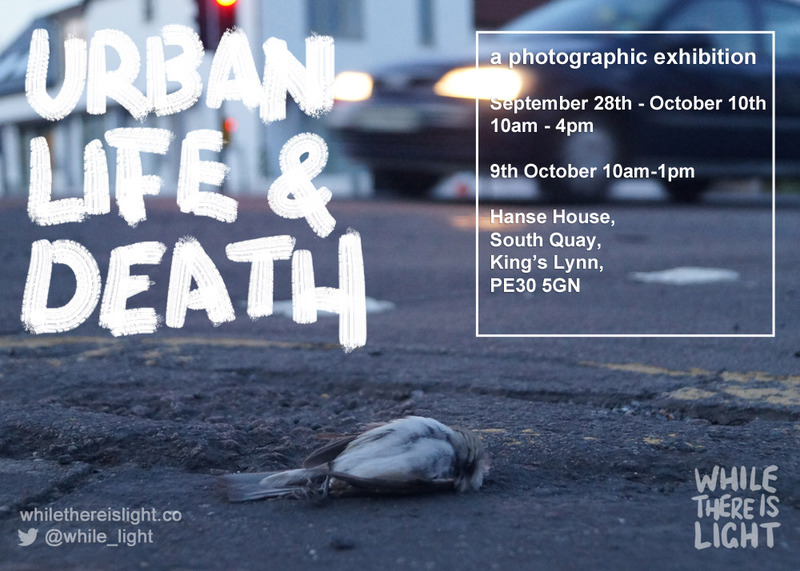 This first solo exhibition, entitled ‘Urban Life and Death’, explores aspects of urban life, documenting found compositions, urban spaces and the people that inhabit them. The exhibition aims to capture fleeting moments, occurrences and hidden details almost lost to the fast-paced and focussed lives of passers-by. The spontaneous ‘shoot from the hip’ style makes for some unusual framing and perspective and adds a certain drama and unpredictability to the shots. The works will be presented without manipulation and post-processing where possible. This reduces the number of process-­based barriers that can stand between an audience and the work. The minimal­-to-­no retouching approach helps preserve the raw moment by not romanticising any given scene or directing emotions and offers an alternative to heavily-processed and filtered works. The exhibition will run from Monday 28th September to Saturday 10th October. The gallery here at Hanse House will be open from 10am until 4pm, expect Friday 9th October when the exhibition will close earlier at 1pm. Entrance is free and the limited edition prints will be available to buy.